Building on a large segment of existing choices like Star Wars Card Trader and Topps Bunt, The Walking Dead is the newest digital option for collectors. The Topps app is similar to their other featured apps where virtual cards can be collected and traded. The TWD app centers on both the main show and Fear The Walking Dead. 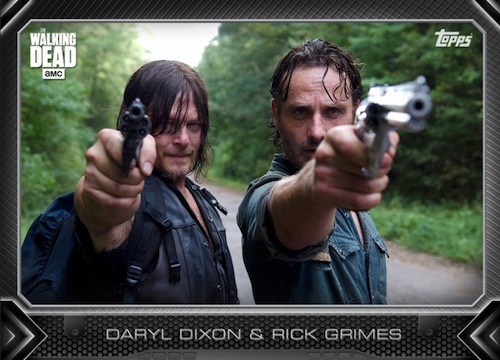 There will also be physical Topps Walking Dead cards coming later in 2016. As first reported on Mashable, the app will include digital content that is directly related to the events of previous episodes. According to Topps, "the app will also react to what happens in the show, as it happens." The Walking Dead Card Trader is an app that is available for download on Android and iOS. While it is free to play, currency can be purchased in the form of credits to buy additional packs. Those who download now will receive one free card each day for the next week. 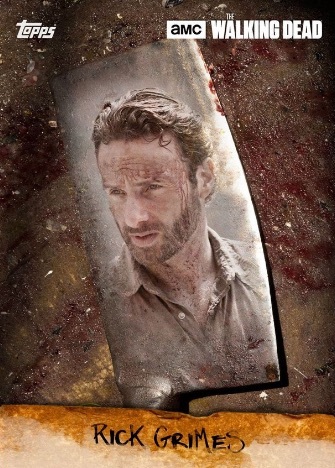 The first marathon card will feature Rick Grimes as a reflection on a blade and is available at 1 PM EST on 5/12. While digital cards have seen a surge in interest, many still prefer the physical route too. Topps has collectors covered on both fronts. Cryptozoic has previously handled The Walking Dead cards, but Topps will reportedly debut 2016 Topps The Walking Dead Season 5 in October. Also on the way, 2016 Topps The Waking Dead Survival Box is a a premium collector's set that is slated for a December release. This new app and card option taps into a massive base of TWD fans and collectors that already devour the many Walking Dead collectibles on the market.